Selling? Get Your Home In Shape! A clean and tidy home will not guarantee it will sell quickly. But one that isn’t WILL keep it from selling. Buyers are finicky, and will very quickly strike your home right off the short-list of candidates, regardless of if it meets all other criteria to entertain the property for an offer. If your home shows over and over and does not sell, or only attracts low-ball offers, maybe it’s time to look at how ship-shape it is. If your home is on the market for too long, realtors who have already seen it will begin to ignore it. It has become “stale”. So, use this list to make sure it’s ready for prime-time before you start showing it. 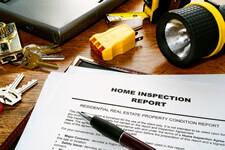 Having a home inspection done by a professional inspector is money well spent. Running between $250 – $500, it will provide you with an un-biased, objective opinion by someone who has seen hundreds or even thousands of homes. Sometimes, inspectors will find things you didn’t know about your home that are in need of attention and would make a potential buyer balk. If necessary, make any repairs BEFORE putting your home on the market. What If I Can’t Afford the Repairs? Sometimes, a home inspection will uncover repairs you can’t afford, but are necessary. You should still get estimates for the work, because they will help a buyer determine if they can afford the home and the repairs. Whenever possible, use all your manufacturer warranties to get things fixed. Make sure also that all user manuals for your furnace, A/C, washer and dryer, dishwasher, and any other similar appliances are available for the potential buyer to review. If Repair Costs are Minor. Do It! Once again. It’s money well spent to make repairs of as many defects as possible. It will give the impression that you have maintained the home well, and a possible buyer will feel at ease that no major problems are to be expected if they decide to make an offer. Small things like sticky or squeaky doors, torn screens, cracked caulking, dripping faucets, stained carpets, cracked drywall, burnt out lights, loose fixtures, worn door handles may seem trivial, but they’ll give buyers the impression your house wasn’t well maintained. A lived-in home is not always ready to show. We all have pets, kids and ourselves rushing about to go to school or work, and that means we tend to leave things strewn about. Unfortunately, that will work against you during a showing. The mess distracts the buyer and keeps from seeing the home itself. It provides too many “other” things that they may not like and will unconsciously influence the impression they form. Take a tour and make a list of things to clear or clean out – kitchen counters, closets, bedrooms and beds, toys and pet items. Spend a little money on closet organizers if you don’t have them. Get rid of old clothes, shoes that you haven’t used in a while. If you have a lot of furniture that contributes to the impression of “clutter”, put as much as you can in storage, especially the large items. Remove personal items such as photos and wall hangings to depersonalize your home as much as possible. Put things in perspective, and remove or store as much as you can during the period while you are marketing and showing your home. It’s only temporary! First impressions are usually the strongest and longest lasting. Your home needs to show that it has been cared for and not mistreated or ignored. Once again, a small investment is money well spent, so if you can’t do it yourself, consider hiring a professional cleaning service. Areas of particular attention should be carpets & flooring, counter tops, cabinets, drawers and behind the stove & refrigerator. Under the sink, bathtubs and showers. Don’t forget to clean windows and doors and the attic or basement if you have one. Open the doors and windows to get fresh air in the home, pay attention to odors and use deodorizer if you have pets. Don’t forget the exterior!! The exterior of your home must be made inviting so it will draw buyers inside for a look. So, make sure your roof is clean and if the paint is over 5 years old, consider giving the exterior walls a fresh coat. Inspect the driveway and fix any cracks or oil stains. Clean and polish door knobs and windows. Finally, clear any shrubs or overgrown plants that clutter the entrance and finish it off with some landscaping if you can afford it. During showings, your home is “on a date”. It needs to look the best for someone to fall in love with it. How do I Price My Home For Sale? You can do this yourself! Although it’s easier said than done, finding out what other similar homes in your area have sold for recently should get you in the ballpark. To help you do this, here is a list of some tips to follow if you go about it on your own. Keep in mind that there are many subtle factors to take into consideration before you have an accurate selling price. Which is why I encourage you to have a Comparative Market Analysis (CMA) done by a Realtor®. For more information about Selling your home and a FREE, no-obligation CMA, visit the Sellers section of my website. So what should I compare my home to? Location – The closer to your house the better, so try to choose from within a mile or two of your home. Good comparable sales are other houses in your neighborhood, your subdivision, on the same type of street as your house, and in your school district. Home style – Focus on comparable sales that are the same home style, construction material, roof type, square footage, number of bedrooms and bathrooms, similar layout (1 or 2 floors), finishes, garage and yard size and community amenities. Upgrades – Does it have a new kitchen? How about a central A/C or window A/C? Is there crown molding, a deck, or a pool? How big is the pool? Community – Does your community offer the same amenities (pool, gym, lake, walking trails, etc.) as what you are comparing? Is there a homeowners association and what are the fees? Sale date – Keep your comparison to homes that have sold recently (2 years max). Even more recently (6 months) in fast moving markets where prices are rising or falling quickly. Value-add incentives – Was down payment assistance, closing costs contributions, or a free TV/Cable offered to buyers? Make sure you take into account the value of any incentives used to close comparable sales. Your home will always be different from your neighbor, even when both are the same model. Those differences—such as when your home has one more bedrooms than the comparables or home office— are what your Realtor® Agent will focus on to determine what adds value to the sale price. Realtor® Agents have been inside many homes in your neighborhood, have access to the tools and are in the best position to find the best comparable sales. They can read the comments a selling agent put into the MLS, seen the ugly wallpaper, and heard what other REALTORS®, lenders, closing agents, and appraisers have said about the comparable sale. If you took it upon yourself to self-appraise the value of your home, do get a professional opinion anyway. Remember, as a homeowner it is hard to be objective and all too easy for self-appraisers to become emotionally attached to the unique qualities of a home. After all, you live there and it is your home! Your Realtor® Agent will be honest with you and offer an un-biased opinion of how your home sale will stack up against the competition in your immediate area. A professional opinion will help you put in perspective the things that affect the sale price and the ones that don’t, regardless of how much you like them. And don’t take any criticism personally as it is a reflection of the things that add or subtract from your property’s value, and not a reflection of you as a person. Should you compare against foreclosures or short sales? Foreclosed properties are often in poor condition because due to very same reason why mortgage payments have not been made, maintenance has also been insufficient or flat-out ignored. Most foreclosed properties are sold below market value and are a poor comparable sale. Short sales are typically in good condition, because often the seller who was occupying the home a the time of sale has maintained the property. However, they are still distressed sales and as such, the sale price may be substantially lower than market value. Don’t forget that Short sales as forced sales due to personal reasons – divorce, relocation to another city or missed payments and a looming foreclosure – resulting in the seller or the lender being willing to lower the price to unload the property. Your Realtor’s® knowledge and experience with the local market is a great asset to have on your side, working for you as you approach the sale of your home. They truly can be the difference between weeks and months of frustration, time wasted and disappointments or a quick and successful sale. Here you will find interesting articles, thoughts, opinions and news about what is going on in South Florida real estate. If you need another reason to visit frequently, remember this: you will find plenty of tips for homeowners, sellers, and investors and information about South Florida luxury properties which will help you enhance the value of your property.